Fiat is one of the world's largest automakers, but when it made headlines by grabbing control of a bankrupt Chrysler in 2009 it was unknown in the U.S. Fiat’s against-all-odds swoop on Chrysler---masterminded by Sergio Marchionne, the Houdini-like manager who saved Fiat from its own near-collapse in 2005 – has made the automaker one of the most unlikely winners of the financial crisis. Mondo Agnelli is a new book that looks at the chain of unpredictable events triggered by the death of Gianni Agnelli in 2003. Gianni, the charismatic, silver-haired power broker and style icon, was the patriarch who had lead the company founded by his grandfather in 1899. But Gianni's own son had committed suicide. Without a mature heir, the dynasty and Fiat were rudderless. 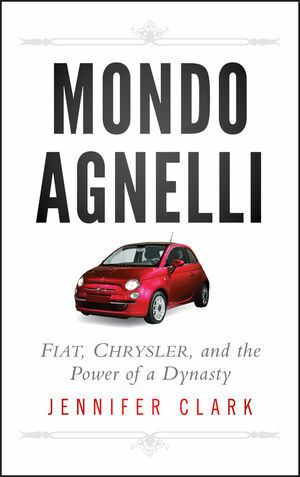 Backed by Gianni's closest advisors, his serious, shy, and determined grandson John plucked Marchionne from obscurity. Together, they saved the family company and, inadvertently, positioned Fiat as a global trailblazer when the global storm hit. A an engaging tale for those interested in the stories behind the economic crash, the book contains never-before reported material about how Fiat succeeded in making Chrysler profitable where both Daimler AG and Cerberus, its previous owners, had failed. A story for a wide audience, from car buffs, business readers, lovers of Italy, and anyone fascinated by the lifestyle of Europe's most glamorous industrial dynasty, this book tells the tale of how Fiat achieved the seemingly impossible -- turning around an American automotive icon everyone else had given up for dead. Jennifer Clark was the Italian Bureau chief for Dow Jones & Co. for ten years until 2010, covering all aspects of Italian business, politics, and finance for the wall Street Journal, wsj.com, and Dow Jones Newswires. Prior to working at Dow Jones, Clark was a banking reporter at Reuters in Milan, and documented Berlusconi's entry into politics for Bloomberg News in the early part of the 1990s. From 1988 to 1993, she was bureau chief at Variety, the U.S. entertainment weekly, covering Italy's film and television industries from Rome.